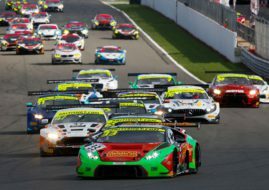 Oman Racing’s Team duo Rory Butcher and Liam Griffin won the Race 1 of British GT round seven at Snetterton. Aston Martn Vantage drivers looked comfortable in an interesting race, beating TF Sport’s Andrew Jarman and Jody Fannin by a margin of 13.098s. Derek Johnston and Matt Bell, another TF Sport’s pair, were the third, just 0.274 slower than their teammates in second. 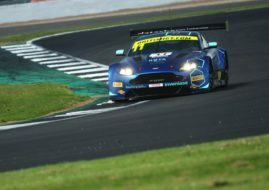 Andrew Howard and Jonathan Adam in Beechdean AMR’s Aston martin were fourth, Joe Osborne and Lee Mowle of Triple Eight Racing finished fifth, while VonRyan Racing pair Ross Wylie and Andrew Watson finished sixth in McLaren 650S. In GT4 class, Oz Yusuf and Gavan Kershaw defended pole position and claimed victory in their Lotus Evora. On second, with a gap of almost 18 seconds, were Will Moore and Dennis Strandberg (Academy Motorsport), while the remaining place at the podium was won by Fredrik Blomstedt and Aleksander Schjerpen in Century Motorsport’s Ginetta G55. 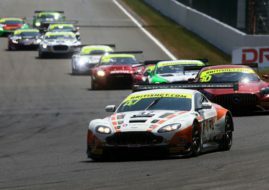 Stay tuned as British GT Race 2 at Snetterton starts 17.30 CET!